Tapsilog is an all-time favorite breakfast in the Philippines. 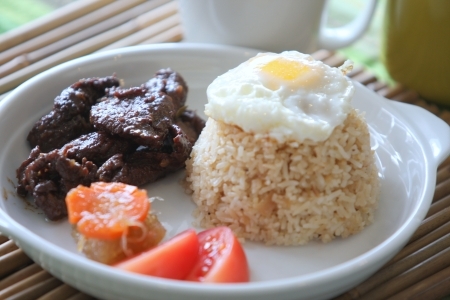 It is the shortcut for Tapa (fried cured beef strips), Sinangag (garlic fried rice) at Itlog (egg) combined into one meal. Although it is considered as breakfast food, it is commonly sold throughout the day in Philippine turo-turo eateries. Beef Tapa is dried cured beef similar to “Beef Jerky”. This is traditionally prepared by curing the meat with sea salt and letting it dry directly under the sun for the purpose of preserving the meat. Nowadays, commercialized Beef Tapa are often cured but most do not undergo drying. Tapa is usually fried and is best served with vinegar. 1. Combine the first 6 ingredients and mix well. Please mash up the chili before adding to the marinade. 2. Pour the marinade on to the beef slices and using your hands, mix the meat well with the marinade. Place in a container with a lid and marinate for at least 1 day (2 days is highly recommended) inside the fridge. 3. Drain the beef slices and place in a non stick frying pan. Add water and cooking oil. 4. Bring to boil in high heat and then let it simmer in medium heat. 5. Let the water evaporate and fry the beef slices with the remaining oil in the pan. Every now and then stir the tapa for even cooking. 6. Cook the tapa slices till it’s dry and have some crispy bits. 7. Arrange your plate with Sinangag first, then put Fried Egg on side and tapa pieces next to it.